I used to love drawing my own treasure maps as a boy, especially the tea-staining stage which transformed my doodled piece of white paper into an antique parchment. I’ve been reliving that childhood experience by producing a toolkit for Adobe Illustrator which helps you construct your own treasure map digitally, using a range of vector assets to plot a route to buried treasure on a fantasy island. Download my free Treasure Map Maker to create fun artwork for party invitations, storybook imagery, wall art and more. It includes vector graphics, brushes and patterns that can be quickly combined to build a fictional landscape. 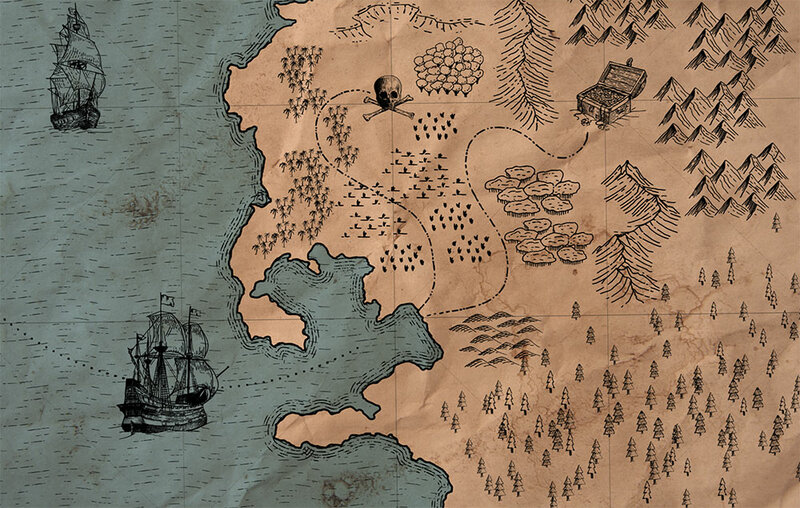 My free Treasure Map Maker is a combination of tools and vector graphics that help you to build an illustrated fantasy map quickly and easily. It contains 24 hand-drawn assets, including mountains, trees, ships, and a treasure chest to fill out the landscape with scenery. Copy/Paste each individual graphic, or drag and drop them directly from the supplied Symbol Library (Tip: The Symbol Sprayer tool is great for placing multiple trees!). Choose from 4 ready-made island outlines, or draw your own using a selection of brushes to add details to coastlines and borders. Pattern brushes of doodled dots and dashes also help you plot your route. Then finish off your map with 3 pattern swatches which add grid effects and an illustrated texture to the seas, before placing the bonus vintage paper texture as an overlay with the Multiply blending mode to give your treasure map the perfect aged appearance. Oh wow, so generous of you! This is amazing! Wow Chris, your website is amazing, your tutorials are so helpful and thank you so much for your generosity. You are awesome. Beautiful work Chris, thanks for sharing! Ayyyeeee this is so cool! Already sharing to my friends who are playing D&D and other tabletop games. Thanks so much! Wow!!! Thanks!! I love it! I love these elements,! Thanks for all the that you do. thank you for sharing – truly fantastic and generous! It was so kind of you to share this with us. Thank you! Dude! LOL This is wonderful! My gratitude! Gosh, thank you. This will be such fun to play with. Just when I thought some serious work was going to happen today! Thank-you so much, this will be so much fun! Arrrrgh! This is an EXCELLENT find! These are wonderful! ‘Still learning Illustrator — as in, I know how to turn the program on, but once I’m in the door, I have no idea where to go (LOL). I am grateful for your generous tutorials & love the freebies! One question, (please forgive the ignorance of this in advance) how or where can I import the beautiful brushes you created? I have CS6 (not CC), so opened the legacy version you so kindly sent, but can not figure out how (or where) to access the brushes. I’m sure you have a beautiful tutorial somewhere on just how to accomplish this elementary task. At any rate, thank you so much for your consistent great resources & info! Thanks Diana! You have two options when using the brushes (and other assets), you can load them into the relevant panel, (so the Brushes panel for brushes) by clicking the small menu icon in the top corner, choose Load Brushes and navigate to the individual asset files in the download. Alternatively, if you open the main file directly, you can copy paste the elements into your working document. When you select one of the paths with the brush applied, it will load the brush so when you continue drawing a new path it will have that line style already applied. This is awesome! Thanks so much, what a fantastic product! Thank you so much for your generosity. It is helpful for me, as a single user just for me and my grand kid. Super idea & great freebies. Thanks so much, Chris! Thanks very much it’s really very interesting! Thank you so much! Actually I’m working on a banner for our next show! It’s about the exodus and the freedom of Israel. God Bless you all! This is so cool Chris. While I don’t have AI, I’m hoping that some of the aspects might be accessed in other programs I use. Muchas gracias Christ Spooner. No había tenido la oportunidad de dejarte un comentario de agradecimiento en tu blog, el cual me parece excelente y me gusta mucho. This is good stuff! You are doing a lot of cool things! Wow, I could have used something exactly like this for a project at one point. But I’m gladly holding onto this for the next time around. Thanks so much!